You’ll get 3 days of complete in-depth training to master all the frameworks needed to succeed. Register now and the complete Rapid Cash Generator Implementation Kit will also ship to you immediately. 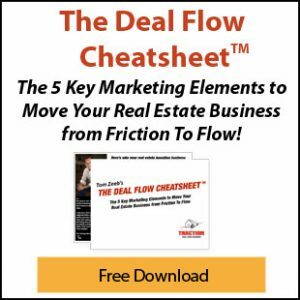 The 5 Key Marketing Elements to Move Your Real Estate Business from Friction To Flow! Learn how to Find the Deal, Make the Deal, and Get Paid. 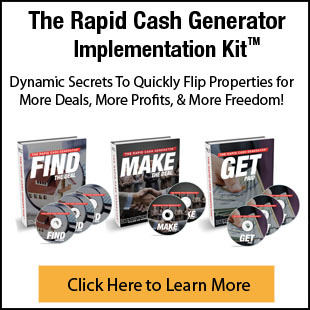 The Rapid Cash Generator Implementation Kit contains all the marketing templates, worksheets, and legal contracts you need to succeed. Learn at your own pace using the easy-to-read manuals & audio trainings. Ships to you immediately. [us_testimonial author=”Luis Martinez” company=”” img=”6546″ el_class=”custom_test”]“I was deployed overseas two weeks ago and am still living out of my bags in transient quarters. However, I’ve applied everything you’ve taught me and my business hasn’t missed a beat! My virtual admin and her crew have been all over everything and I’ve been able to supervise it all from my iPad. [us_testimonial author=”Jashiema Roach” company=”” img=”6516″ el_class=”custom_test”]This is a dream come true. I am still in shock and it really doesn’t feel real. Yes, I have seen people get up and talk about making thousands of dollars and have been really excited thinking just maybe it could happen to me and now it has! It CAN happen. . . don’t give up! Just keep believing. I am blessed. [us_testimonial author=”Kenton Newby” company=”” img=”6521″ el_class=”custom_test”]Tom continually stressed that as a wholesaler, you’re really in the customer service business… Tom is definitely the go-to guy! [/us_testimonial][us_testimonial author=”Ken Williams” company=”” img=”4241″ el_class=”custom_test”]Tom Zeeb is a man of his word — a breath of fresh air within the real estate investor community. I have first hand experience observing Tom remaining calm during the unpredictable stages of a settlement transaction. I highly recommend Tom to anyone considering doing business with him. [/us_testimonial][us_testimonial author=”Liz Dauw” company=”” img=”4244″ el_class=”custom_test”]Tom, I wanted to thank you and tell you how well your advice has worked for me. When the investor asked me to do something for him, which worked in his favor, not mine, I luckily thought of what you said: “always ask for something in return”. To my amazement, not only did this work seamlessly, but it gave me both the advantage I was looking for, and one I hadn’t even considered until that moment. it also put me in very good standing with him – I think it truly impressed him, and brought his guard way down. Now he seems to really want to work with me on this deal. Wow. It really IS like playing chess isn’t it? [us_testimonial author=”Michael Blank” company=”” img=”6527″ el_class=”custom_test”]By working with Tom’s system I’ve been able to get started much more quickly and avoid mistakes. Without Tom’s system, I wouldn’t have had the confidence to get started or perhaps the persistence to stick with it, especially after several months of marketing that didn’t produce a deal. [/us_testimonial][us_testimonial author=”Melana & Mike Wilson” company=”” img=”6525″ el_class=”custom_test”]We want to thank you for your advice and teaching materials – – Both were critical to the successful outcome of this deal. [us_testimonial author=”Kathi Reid” company=”” img=”6520″ el_class=”custom_test”]Thanks to your training, I had my first deal, on Edmondson Avenue, within a week of the completion of the business and marketing plan. It was an exciting jump-start to becoming a successful investor. And the $10,000 profit! Yes! [/us_testimonial][us_testimonial author=”C Willis” company=”” img=”6514″ el_class=”custom_test”]Shortly after I became one of Tom’s students I found that he has a very structured regiment that allowed me to line my goals up with the activities needed to accomplish them. [us_testimonial author=”Justin Lee” company=”” img=”6518″ el_class=”custom_test”]Tom Zeeb has the knowledge and insight to teach investors everywhere techniques that will put CASH in their pockets tomorrow. The last deal that I worked on put over $40,000 in equity in my pocket, along with a positive cash flow of over $400/month. If you’re not already working with Tom, you need to start immediately. He’ll improve your education and help you put more money in your bank account. [/us_testimonial][us_testimonial author=”Mouhamadou Diagne” company=”” img=”6528″ el_class=”custom_test”]I thought Tom to be insightful and practical. I also found great inspiration in your personal story and what you have been able to accomplish over the past years. It’s the kind of winning story and inspiring leadership that give me tremendous optimism and courage as a new investor exploring the tough but rewarding field of real estate investment. [us_testimonial author=”Vince Kiste” company=”” el_class=”custom_test”]I just joined and I’ve reviewed the home study system and forms library and am very pleased and impressed. After so much study of REI, it was very comforting to see the nuts & bolts, “the resources”, as well as a planned process to succeed. Seeing what you made available reinforced for me the feeling that I ‘have arrived’ and am in the right place. Very happy to be training with you, Tom. My life just changed; feeling lots of gratitude. Thank you Tom. [/us_testimonial][us_testimonial author=”Traci Thomas” company=”” img=”7058″ el_class=”custom_test”]I took your wholesaling basics class. You taught me a lot! I was just getting started, learning investing and setting up my biz, etc. Anyway, I’m proud to tell you that I am under contract on my first deal!! It’s only a couple of miles from my home! [/us_testimonial][us_testimonial author=”Kerry H” company=”” img=”6522″ el_class=”custom_test”]I just closed my first deal! With the help of Tom Zeeb’s system, I successfully negotiated a SWEET buy and hold deal where the seller carried back 100% of the sale price for 3 years at ZERO percent interest! The monthly principle payments to the seller are low enough that I can easily cash flow the property at about $600/month for three years, then when I cash out at the end of three years, I will have over 80,000 in equity in the property! [us_testimonial author=”Michael & Samantha” company=”” el_class=”custom_test”]Dear Tom, Thank you for your insightful teaching. We genuinely appreciate how you are changing and challenging real estate investors and the world. You are a truly unique and charitable individual who inspires and motivates those you meet, to emulate your exceptional warmth and ethical code of conduct to everyone that they encounter. You display exemplary qualities, which are a rare find in today’s world! Our journey has been illuminated, since the intersecting of our paths. We treasure that memorable opportunity. [/us_testimonial][us_testimonial author=”Dani-Jean Stuart” company=”” el_class=”custom_test”]I’m VERY happy with the course materials! I’m currently working on my very first property for wholesaling, in the negotiation process right now! Making more calls on others today.